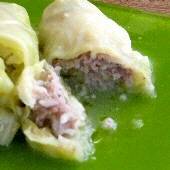 Stuffed cabbage with ground beef and rice are covered with a traditional egg and lemon (avgolemono) sauce. Conventional Greek wisdom is that the best cabbage can be found after the first frost, so all versions of stuffed cabbage are winter favorites. 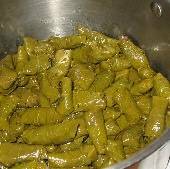 In Northern Greece, stuffed cabbage called yiaprakia(γιαπράκια, say: yah-PRAHK-yah), are made withtoursi (brined) cabbage and ground pork, and are a traditional Christmas dish. This simpler version can also be made with large Romaine lettuce leaves, or Chinese cabbage.